Holy crap, these things should have been around YEARS ago, and they certainly should be in stores now. 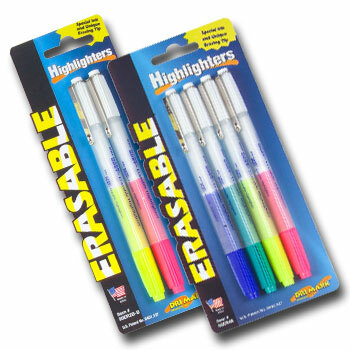 Erasable highlighters! I got these as a gift from a friend of mine who shares my obsession with office supplies and they blew my freakin’ mind. Technologically speaking, they’re nothing special — my sister and I had erasable markers as kids that worked exactly the same way — but in this GTD, DIY world of ours, oh, the uses! Let’s say you’re a student, for example. You want to highlight passages in a book to use in a term paper, rather than typing/writing them all out — but the book belongs to the library, or you want to sell it back at the end of the semester. Problem solved! Just erase all of your highlighting when your paper is finished. You could also highlight a to-do list chromatically according to priority and erase the highlighter when you cross off the things you’ve completed so they don’t distract your eyes. Of course, there are other, artsier things you could do with erasable highlighters, too, but from a business standpoint I think they’re pretty darned useful. The only drawback I’ve found so far is that once you’ve erased a spot you can’t re-highlight it, which means you can’t change the color something is highlighted in. I have yet to see these in any office supply/stationery stores, though they supposedly carry them at Office Depot. You can find them here, at $2.99 for the whole set of four (plus shipping, natch).